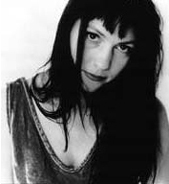 Lisa Germano's new album "Lullaby for a liquid pig" sounds like a melancholy dream. But under this sadness lies also some irony. E.C. : Many people remember you because you played for John Cougar. For what do you want to be remembered? Lisa: I think that very few people remember me for that. Its just what the media keeps saying. I did that over 15 years ago. I played with him for like 8 years. I think that I have done a lot of things that are much more important to me than that. But people don't have to remember me for anything. I actually don't agree that people remember me from that. If I want to remembered for anything than for my last album "Lullaby for liquid pig" and for "Geek the girl". Most people that know my music like this one best. E.C. : "Lullaby for liquid pig" has this kind of sadness that brings you down. That's the effect it has at least on my. Did you try to pack your demons into songs? Lisa: It's actually just to communicate with other people. My music brings some people down. I can understand that. It's just not your coup of tea, its not your thing. E.C. : But I like it, it just makes me sad. Lisa: Okay, I don't wanna bring people down. Other people say that it actually makes them feel better. The know that somebody else feels the same they do. Some people take my music in and then it becomes about them. Its not really about me by the time I put it on a record. So that's when it works for me. If someone likes it, that's wonderful. But if they actually take it in and they feel something about themselves from it. Then its really working. Because it is about some dark stuff. But it's not about dark stuff to stay dark. My songs are about to get out of the darkness. You have to see the dark stuff to be able to get out of it. A lot of people don't look. They feel depressed. They don't try to solve their problems. In my music I try to solve this kind of problems. I hope that people can feel that. E.C. : There is a little contradiction in your new album. The dreamy lullabies are disturbed by scary noises in the background. Lisa: It's a kind of a mockery. Think of fairytales or dreams. You see things in coded messages. Its put in a nice way, but its like a bad lesson. Like a lot of fairytales are about really bad things, although the stories seem to be very nice. I also mocked about some of my behaviors. For example: I need too much. I am thirsty for people, for too much love, for alcohol, sometimes. Some of the songs on "Lullaby for liquid pig" show some of that behavior. A lot of us do that. That's why I called it a lullaby, because its pretty and at the same time not. E.C. : Do your albums have a kind of a healing effect on you? Lisa: The definitely do. The only reason I would put it on a record is to put it to other people. Hoping that that energy can do the same for them. Not all people can relate to that. Some people don't wanna go there and I understand that. If I finish a song and edit out all the things that are too personal, all of a sudden you are left with this feelings, that I truly believe someone else can feel. And actually sometimes can make me cry for happiness, or sadness. But its always that thing that I feel that other people need some help too. E.C. : Your music has always and stills fits perfectly to the label 4 AD. After your last album "Slide" (1998) they dropped you. Lisa: 4 AD changed a lot. When they had to let me go it was at a time when Ivo Watts-Russell (founded 4 AD) was leaving, Dead Can Dance broke up, there was no more Pixies, Breeders where still not making a record and Belly broke too. All the bands that were actually bringing them money, so they could have artists like me, because I don't sell many records. There was just no money coming in. They knew that they would have to let go of a bunch of people. In that process Ivo left and Robin Hurley, who used to run it. He is my manager. I am honored that I was on 4 AD, but I don't feel that I need to be on it now. E.C. : When I listen to the very sad music of the song "Its party time". It sounds like a joke. What's the story behind it. Lisa: I am mocking about myself in this song. Sometimes you drink wine and you think you are having a party. And you get all this thoughts about how much you hate yourself and you are not the person you wanna be, and you are not living in the real world. Hey, its party time. It's just a joke. Lisa: It's funny because in Europe almost everybody that interviewed me must have read the same article. I probably only said that like once. I probably must have had a bad day. And the other is that just had lost my record deal. So, I was not sure if I would make another record. I always write but I never think that I will make a record until the songs start to work together. Than I will say: ok, lets make a record. Its different than most artists. Most artists would: I am making a record and then they write songs. I write songs when something's happening. I have to wait for that (laughs). E.C. : What must happen that you write a song? Lisa: Something that moves me. E.C. : Do you still work in the bookstore in L.A.? Lisa: Yes, but I haven't for this whole year because I was promoting my new album. When I am done I can go back. But I would have to substitute and work my way back in. But they always let me come back. E.C. : Are you also experience things there that you put into songs? Lisa: No. The bookstore is so different. That's why I like it. Because music is like all circular. You have to wait for the feeling to come. You have to experiment. You tried a song and it didn't work, some other day it will. The bookstore is like A, B, C, D, E. When I do the cash register its like: you give me money and I give you change. It's very definite. I like the difference. The bookstore is not art, its organization. E.C. : You session for a lot of people. What was favorite session? Lisa: I have to mention 2 people. With one I have been touring for the last 2 years. Its Neil Finn who used to be in Split Enz and Crowded House. I was a huge fan way before I ever met him. I already knew the songs. Its like I am singing on some of my favorite songs. And Neil is a really wonderful person, goodhearted and funny. He is everything. That's probably my favorite I ever done in another band. My session I did with David Bowie was very exciting because he was so cool. He was so gracious and so excited about experimenting. Some artist don't care. They say: try what you want. David Bowie was like: I got this idea, try this or that. I just love being around creative people. Especially around people that are so famous that they could be snotty. And he is not. At his place in live he is still very creative. E.C. : What was the best compliment someone ever said about your music? Lisa: There have been many, when people actually do connect to my music. Strangely enough, there is one that stays with me. I did a show with this record a few month ago. Afterwards a lady came up to me and said: thank you. I replied: thank you. And she said: no, thank you!! Then she started to cry and said again: thank you so much!! It still turns my stomach. I knew that I connected with her but I also felt sad because she must have been going through something very sad. E.C. : What surrounding do you need to write songs? Lisa: A tape player, a piano, my cats and some wine and candles. I mostly write at my home at night. I need atmosphere to write songs. I couldn't write at a ugly place.